Online grocery sales rose ten per cent at Sainsbury’s, the retailer said in its trading statement for the 15 weeks to 9th January. “We had a record week in the quarter, delivering over 289,000 online orders. We now have 101 Click and Collect sites nationwide,” said chief executive Mike Coupe. Total Retail sales for the third quarter were up by 0.8 per cent, excluding fuel, and down 0.7 per cent including fuel. Like-for-like retail sales were down 0.4 per cent, excluding fuel, and down 1.8 per cent including fuel. “Given our good performance in this quarter, we now expect our like-for-like sales in the second half of the year to be better than the first,” said Coupe. “Food deflation and pressures on pricing will ensure that the market remains challenging for the foreseeable future”. * Sainsbury’s made headlines at the beginning of January with the news that it had made an offer to buy Home Retail Group. The offer was rejected and it now has until 2nd February to decide if it wants to launch a new bid. In the meantime, it has set out the reasons why it believes a takeover of Argos makes business sense – and supply chain issues are near the top of the list. In a document entitled “Accelerating our strategy for growth” it pointed to the benefits of optimising the use of combined retail space, together with combining the delivery networks for delivery to store or home for food, clothing and general merchandise. There are already Argos concessions in a number of Sainsbury’s stores. But Sainsbury’s plan would include relocating a number of Argos stores into nearby Sainsbury’s supermarkets, and extending the click & collect footprint across the two estates. 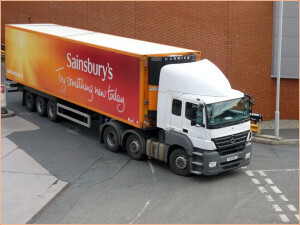 Sainsbury’s distribution network is optimised to distribute large volumes to stores, particularly time-sensitive perishable items. It also has a fleet of vans to deliver online orders from stores to customers’ homes. Last year Argos completed its hub and spoke model that uses larger stores as hubs to supply smaller stores. This enables an order for any one of 20,000 products to be available in any Argos stores within hours. And in October it launched Fast Track, a same day home deliver or store collection service. It also has a two-man home delivery service for bulky items such as furniture and white goods. Sainsbury’s also said that it saw opportunities for operation efficiencies and enhanced buying scale from a deal. Morrisons’ Christmas trading statement revealed it experienced online sales growth of nearly 100 per cent year-on-year. Like-for-like sales excluding fuel in the nine weeks to 3rd January were up 0.2 per cent, and down 0.6 per cent including fuel. Total sales excluding fuel were down 1.2 per cent, and down 1.7 per cent including fuel. Like-for-like the number up transactions in the retailers core supermarkets was up 1.3 per cent, year-on-year. “We are pleased with our improved trading performance over the Christmas period,” said chief executive David Potts. “While there is of course much more to do, we are making important progress in improving all aspects of the shopping trip, and our customers tell us they are pleased with the changes.